Well summer is officially here! What are your summer plans and goals? Mine are to spend more time with family, friends and my pets. I love the cool morning air. It’s the best time to get out and walk with my dog. It’s my zen time. We have already taken a few trips to Stone Mountain and hiked the trails with our dog Cole and some of her friends. She loves it! New sights and smells are everywhere, and swimming! We plan to do more of it too. I also like going to places where my dog is welcome… parks, restaurants and stores. Whatever your plans include your pets wherever you can. And let me know if you have some other ideas I’d love to hear them. Did you know that dogs in shelters and here at the jail become institutionalized after a while just like human inmates? It’s is important for shelter animals, as well as your own, to get a change of scenery and different forms of stimulation every now and then. Here at the jail we play in kiddie pools with the dogs on hot days, put wet food in Kongs and freeze them, have volunteer dog walkers take them to the park for a couple hours, have them play with puzzle food dishes, as well as a variety of other things to do or best to keep our 18 Jail Dogs from suffering from institutionalization. or Panic for Your Dog? Pet owners often ask me what they should expect during their pet’s first massage session; where to set-up, what I need, etc. 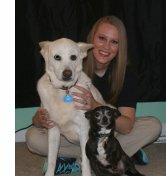 Although each session is unique, I will run through some key points for your pet’s first massage session. First, the most important part of my business is that I am mobile and the massage takes place in your home. This is key because this offers your dog the most comfortable, relaxing, and beneficial massage session possible. Another important part of how I have my massage sessions set-up is that, unlike some massage therapist I do not charge by the hour, a session is a session, no matter how long or short it may be. I let the pet determine how long our session needs to be, after all these sessions are about them! 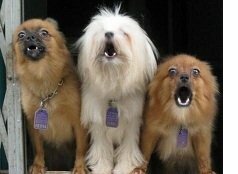 Why Does My Dog Bark on Everything? 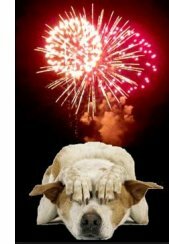 Fourth of July: Partyor Panic for Your Dog? knows a stranger and greets everyone with a smile. Our mission at Daffy’s Pet Soup Kitchen is to keep families and their pets together. It’s no secret that America has an overpopulation of homeless pets. By providing pet food to families that would otherwise have to give up their beloved pets, we are helping to keep animals out of shelters and in their warm, happy homes where they belong. This also gives the animals currently in shelters more time to find their forever homes. And, we suggest you start with your dog! Funnybones for Dogs, located in Lilburn, is happy to offer Good Dog! Coaching & Pet Care clients $10 off bathing services through the end of July - that means for only $15 (short coats) or $25 (long coats) your dirty dog will be transformed into a squeaky-clean canine! Nail trims available also. (Bonus: add $10 for a 6-day flea deterrent treatment!) Saturdays only - quick turnaround. Call (770) 925-9030 to schedule a priority appointment. Pet Super Store- Going out of business after 20 years! Huge going out of business sale, awesome mark downs. If you have pets you’ll want to stop in to pick up a lot of great deals. Dog food, treats, accessories and many other pet related and exotic items.